God’s got the overall plan for me under control, so I’m just working on the little stuff here on my end! Today, I’m enjoying a cup of coffee while I reflect on this past week, look forward to the one beginning, and do what I can to make the week more successful for all of us here at ExpatPrep! We found out on Friday that Tigger may be leaving us this week. His grandparents have requested that they be given custody, and it looks like that might happen, despite lots of reasons why that is a really bad idea. Poor Pooh and Tigger – we’ve been trying to prepare both boys for it. Tigger will be happy to live with his grandparents, but he does not really understand that this means that he will not see us again. And Pooh, well, he loves having friends come live with us, so when he heard that Tigger might go live with his own family again, he burst out in tears over a past foster child that had gone home and he still misses. He’s pretty social, that Kiddo! I’ve been packing up all of Tigger’s stuff in case the judge says to move him, and I’ve been in tears already multiple times. Life as a foster parent is not easy, lemme tell you! But I’m trying this week to stay strong and help the boys deal with this parting. I’m sure that I’ll be crying on P-daddy’s shoulder on Wednesday, either out of sadness for Tigger, who has so much potential but really needs a stable home, or out of joy that maybe there’s some hope for the system after all. With all that’s going on this week, I definitely need quick and easy! I’ll be relying a lot on the meals and ingredients in Sue’s Simple Starter Menu, but we’ll be eating out several meals as well. Meals here follow Trim Healthy Mama guidelines, and are marked as S (= Satisfying), E (= Energizing), and FP (= Fuel Pull). 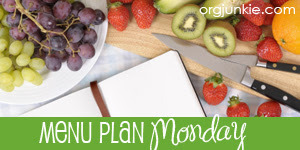 I’m linking up to Menu Plan Monday over at Organizing Junkie, to Monday Coffee at The Move to America and to Trim Healthy Tuesday over at Gwen’s Nest and Stacy Makes Cents – come on over and find all kinds of other things to put in your mealplan! I’m so sorry. We’ll pray for you guys. Thanks – we are doing well, though we will definitely miss the little guy!